The ISO accuracy test standard for five-axis machining centers was revised recently. A cone frustum cutting test by end milling, well-known for testing multi-axis controlled machine tools for aircraft part processing, is adopted in the ISO standard as a similar and precise test. It considers both the accuracy of the finished test piece and an interpolation accuracy test measured by ball bar in the same-feed motion of cone frustum cutting. 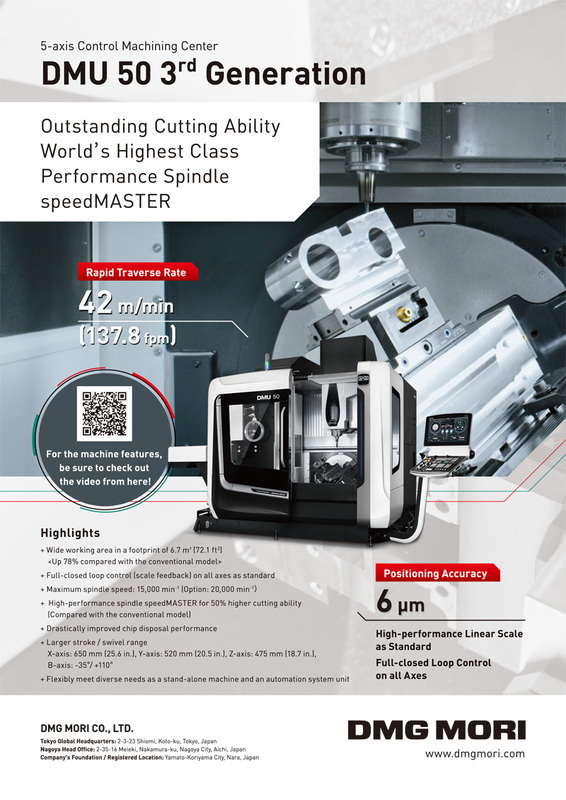 Although it is possible to apply the ISO test methods to various structures of five-axis machining centers, the application of the cone frustum test to multi-axis machine tools with a rotary axis on the workpiece side is rare; thus, it is difficult to evaluate the test results. In this report, the ISO test method was outlined. Next, the ball bar cone frustum test was performed on a five-axis machining center whose two rotary axes were located on the workpiece side. The evaluation method of the test results is discussed. Moreover, the ball bar cone frustum test was also performed on turn-mill complete machining centers to confirm the effectiveness. Y. Ihara, K. Tsuji, and T. Tajima, “Ball Bar Measurement of Motion Accuracy in Simulating Cone Frustum Cutting on Multi-Axis Machine Tools,” Int. J. Automation Technol., Vol.11, No.2, pp. 197-205, 2017. ISO10791-6, “Machine Tools – Test conditions for machining centres – Part 6: Accuracy of speeds and interpolations,” 2014. ISO10791-7, “Machine Tools – Test conditions for machining centres – Part 7: Accuracy of finished test piece,” 2014. S. Bossoni, “Geometric and Dynamic Evaluation and Optimization of Machining Centers,” Fortschritt-Berichte VDI, Reihe 2, Nr. 672, 2009. Y. Ihara and S. Matsushita, “A Study on Tool Position and Posture Measurement Device by Using Parallel Mechanism,” Int. J. of Automation Technology, Vol.3, No.3, pp. 271-276, 2009. Y. Mizugaki, “Effect of Workpiece Location on Manipulability Measure in 5-Axis-Controlled Machine Tools,” Int. J. of Automation Technology, Vol.4, No.3, pp. 268-272, 2010. B. Sencer and Y. Altintas, “Identification of 5-Axis Machine Tools Feed Drive Systems for Contouring Simulation,” Int. J. of Automation Technology, Vol.5, No.3, pp. 377-386, 2011. S. Ibaraki and W. Knapp, “Indirect Measurement of Volumetric Accuracy for Three-Axis and Five-Axis Machine Tools: A Review,” Int. J. of Automation Technology, Vol.6, No.2, pp. 110-124, 2012. S. Ibaraki and Y. Ota, “Error Calibration for Five-Axis Machine Tools by On-the-Machine Measurement Using a Touch-Trigger Probe,” Int. J. of Automation Technology, Vol.8, No.1, pp. 20-27, 2014. M. Tsutsumi and A. Saito, “Identification and compensation of systematic deviations particular to 5-axis machining centers,” Int. J. of Machine Tools & Manufacture, Vol.43, pp. 771-780, 2003. M. Tsutsumi and A. Saito, “Identification of angular and positional deviations inherent to 5-axis machining centers with a tilting-rotary table by simultaneous four-axis control movements,” Int. J. of Machine Tools & Manufacture, Vol.44, pp. 1333-1342, 2004. Y. Kakino, S. Ibaraki, I. Yamaji, K. Ogawa, and H. Ota, “Measurement of Motion Accuracies of Five-axis Machine Tools by Using the Double Ball Bar Method DBB5,” Proc. of 2008 Int. Symposium on Flexible Automation, 2008. S. Ibaraki, Y. Nakino, T. Akai, N. Takayama, I. Yamaji, and K. Ogawa, “Identification of Motion Error Sources on Five-axis Machine Tools by Ball-bar Measurements,” Precision Engineering, Vol.76, No.3, pp. 333-337, 2010. Y. Ihara, “Ball Bar Measurement on Machine Tools with Rotary Axes,” Int. J. of Automation Technology, Vol.6, No.2, pp. 180-187, 2012. S. Weikert, “R-test, a New Device for Accuracy Measurement on Five Axis Machine Tools,” Annals of the CIRP, Vol.53, No.1, pp. 429-432, 2004. B. Bringmann and A. Küng, “A new Measuring Artefact for true 3D Machine Tool Testing and Calibration,” Annals of CIRP, Vol.54, No.1, pp. 471-474, 2005. B. Bringmann and W. Knapp, “Model-based Chase-the-Ball Calibration of a 5-Axes Machining Center,” Annals of the CIRP, Vol.55, No.1, pp. 531-534, 2006. G. H. J. Florussen and H. A. M. Spaan, “Static R-test: allocating the centerline of rotary axes of machine tools,” Laser metrology and machine performance VIII, pp. 196-202, 2007. S. Ibaraki, C. Oyama, and Otsubo, “Construction of an Error Map of Rotary Axes on a Five-axis Machining Center by Static Rtest,” Int. J. of Machine Tools and Manufacture, Vol.51, pp. 190-200, 2011. Y. Ihara and Y. Hiramatsu, “Design of Motion Accuracy Measurement Device for NC Machine Tools with Three Displacement Sensors,” Int. J. of Automation Technology, Vol.5, No.6, pp. 847-854, 2011. C. Hong and S. Ibaraki, “Observation of Thermal Influence on Error Motions of Rotary Axes on a Five-Axis Machine Tool by Static R-Test,” Int. J. of Automation Technology, Vol.6, No.2, pp. 196-204, 2012. S. Ibaraki, Y. Nagai, H. Otsubo, Y. Sakai, S. Morimoto, and Y. Miyazaki, “R-Test Analysis Software for Error Calibration of Five-Axis Machine Tools – Application to a Five-Axis Machine Tool with Two Rotary Axes on the Tool Side –,” Int. J. of Automation Technology, Vol.9, No.4, pp. 387-395, 2015. NAS 979, “Uniform cutting tests – metal cutting equipment specifications,” Aerospace Industries Association of America, pp. 34-37, 1969. Y. Ihara, “Possibility of Ball Bar Test on Multi-axis Machining Center,” Laser Metrology and Machine Performance VII, pp. 107-115, 2005. M. Matano and Y. Ihara, “Ball bar measurement of five-axis conical movement,” Laser Metrology and Machine Performance VIII, pp. 34-43, 2007. N. Kato, M. Tsutsumi, and Y. Chen, “Error evaluation by geometry deviation on five-axis controlled machining center that imitates cone frustum cutting,” Proc. of Spring meeting of JSPE, pp. 703-704, 2013 (in Japanese). Y. Takeuchi, “Special Issue on Multiaxis Control and Multitasking Machine Tools,” Int. J. of Automation Technology, Vol.1, No.2, 2007. A. Nagae, T. Muraki, and H. Yamamoto, “History and Current Situation of Multi-Tasking Machine Tools,” J. of SME Japan, Vol.1, pp. 1-5, 2012. ISO13041-6, “Test conditions for numerically controlled turning machines and turning centres – Part 6: Accuracy of a finished test piece,” 2009.